Nick Davey scored a hat-trick for Wisbech St Mary at Needham Market. March Town United and Wisbech St Mary chase semi-final places in the Thurlow Nunn Eastern Counties Division One Cup tonight (February 20). 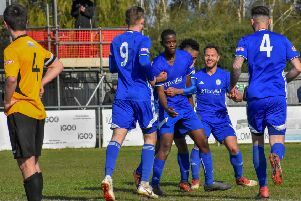 It’s a welcome rest from league action for two struggling sides, although Wisbech St Mary did win a Division One match for the first time since August 26 on Saturday (Feb 17th) when triumphing 4-1 at Needham Market Reserves. Nick Davey scored a hat-trick in that game with Dale Parnell also on target. Wisbech St Mary have the tougher task at seventh-placed Debenham LC, while March host fellow bottom six side Norwich United Reserves. Quarter-finals: Debenham LC v Wisbech St Mary, March Town United v Norwich United Reserves.